Buckingham Palace only opens to the public for a couple of months each summer, but another royal residence in central London is open all year round. You don't get to see Prince Harry's bachelor pad, nor the suite of rooms where Prince William's family have the runaround. But you are allowed inside the other half of Kensington Palace, where a succession of monarchs lived and entertained, and currently <Bargain Klaxon> at half price. One wing of the tour is temporarily sealed off for an exhibition upgrade, but the rest is yours for £7.50, so long as you book online and turn up by Wednesday 10th February. There's a similar offer on at Hampton Court, and that's also well worth a cut-price winter visit. But a bargain at KP doesn't come round very often, in case you've never been. I'd never been. If you can't place Kensington Palace it's up the far western side of what you might think of as Hyde Park, but is actually Kensington Gardens. These used to be the grounds of the house when it was simply a mansion in the countryside, which'd be the late 17th century, and has since been considerably built up and extended by royal prerogative. The Round Pond was added to look elegantly ornamental from one particular set of windows, and the Serpentine also owes its existence to a regal resident. A fine set of formal gardens faces the park, fully accessible by the public, although much of this consists of very recent additions to add some landscaping oomph. One intriguing feature is The Wiggly Walk, a zig-zag pathway descending through hornbeam hedging, at present 100% dead leaves, but considerably more attractive during any other season. 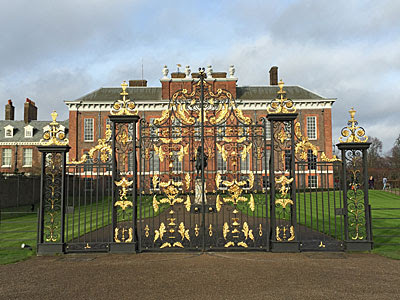 Wills and Harry (and their armed bodyguards) hold sway at the front of Kensington Palace, so the public entrance is round the back, beyond the golden gates, beneath a fresh Diamond Jubilee porch. The first lobby is open to anyone, because it leads to the shop and cafe, and because the more people stop by for a tea towel and a slice of cake the better. The ticket office is off to the left, your purchase permitting access through to the foot of the Stone Stair and the main vestibule, from which all routes around the palace begin. There are four of these, each historically themed, the intention being to tell the story of four very different eras at the house, each in a rather different way. Kensington Palace isn't your normal heritage trudge, it was revamped in 2012 in a style described as 'tradition with a twist'. Expect an emphasis on fashion and a more theatrical vibe, with a sense of storytelling throughout. Rest assured that's not as ghastly as it sounds. I thought I'd follow the four routes in chronological order, which meant heading to the first floor via a long corridor. The redesigners have done a smart job decorating the walls with tapestry-like motifs, and made an intriguing feature of a long bench by using cushions to create a portrait timeline. The far stairs feature a similarly charming stitched family tree, including the King and Queen whose apartments are entered next. They were William and Mary, who sailed in from Holland to cut off the Catholic line, but found Whitehall's damp riverside atmosphere not to their tastes. They made the move to Kensington in 1689 and invited Sir Christopher Wren to do up the house in a non-ostentatious Dutch style. I was fortunate to find the long gallery occupied by one of the Palace's Explainers, who give talks in different parts at different times of day. He brought the place to life, with more than a whistlestop tour through history, whereas I'd have learned rather less from the information panels dotted throughout the rooms that follow. These stick to the basics of Mary's story, her tenure at the Palace cut short after five happy years by an unfortunate bout of smallpox. Her bedroom is a dark space with a poignant four-poster, and the last of the chain of six rooms here, which are perhaps a little underwhelming. By contrast, wow, the Georges didn't hold back. George I wanted to make an impact on arrival from Hanover, and had Kensington Palace's state rooms suitably upgraded. 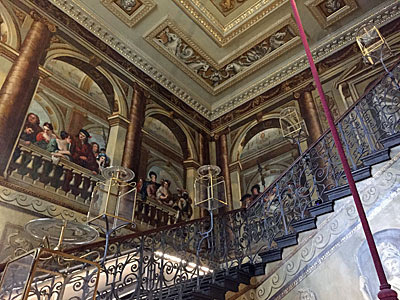 The first indication of this is the grand staircase, a showy ascent whose walls are painted with scenes featuring 45 of the palace's courtiers. The next two rooms acted as social filters, screening out the uncourtly, and are bedecked with art from the Royal Collection (yes, that's Cupid and Psyche by Van Dyck). But it's the Cupola Room that takes the breath away, with its high octagonal domed ceiling and gold statues in marble recesses. Queen Victoria was christened here... but we'll come back to her. The King's Drawing Room was the hub of daily activity, often card-game-related, and has the window from which the Round Pond was meant to be viewed. 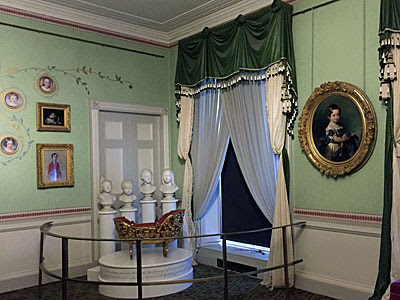 In Queen Caroline's Closet we learn of the love George II's wife had for the place, and her penchant for surrounding herself with the arts and science intelligentsia of the day. On the wall of the King's Gallery is a large gilded wind-dial showing a map of the seas of Northern Europe, then crucial to trade. And throughout the apartments the rooms are dotted with costumes of the day, or rather perfectly-constructed paper reproductions, very much in keeping with the reimagination of the visitor experience. This circuit was the most must-see of my visit, and all the better to enjoy it in January splendour with barely another visitor present. Princess Alexandrina Victoria was born at Kensington Palace in the last year of her grandfather George III's reign. She was still living here a month after her 18th birthday, when her uncle William IV died and the news came that she was now Queen. 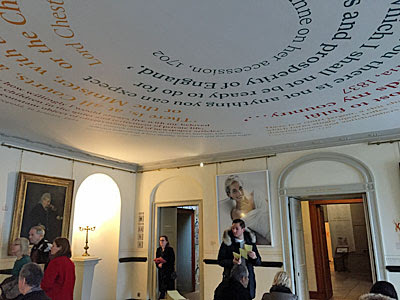 The first room you enter on this part of the tour is where the privy council met that morning to confirm the accession, kicking off a tale of Victoria's life told in her own words. Quotations from her diary are transcribed onto carpets, walls and cabinets, in a handwritten font which those with a poor command of English must find hard to read. This allows for a more emotional history than usual, the largest room given over to her passion for Prince Albert ("such beautiful blue eyes, an exquisite nose, and such a pretty mouth with delicate moustachios and slight but very slight whiskers"). The decoration in this part of the palace is nothing special so it makes sense to concentrate on words and the occasional object, from childhood toys to the success of the Great Exhibition. The personal focus adds to our empathy at Albert's death, and the queen's subsequent long period of mourning, with a series of rooms black in both tone and contents. It's then somewhat jolting to see the celebrations of her Diamond Jubilee on flickering film, as a nod to the modern era her passing presaged.